This happened to me in a rental apartment and I had to be creative to solve it. The geniuses who designed the bathroom managed to fit a drawer about a centimeter behind the door, and eventually what had to go wrong went wrong: the drawer was full of stuff and once we closed the door, the drawer reopened a bit, blocking the door from opening more than about a centimeter, blocking us from entering the bathroom. Not enough to let daylight go through, but enough for me to be able to get the drawer to open even more by pushing the door back and forth. And because of the form factor of the drawer (the front panel being a couple of centimeters larger than the drawer itself, I felt the more the drawer would open, the more I could open the door, to the point that I could actually get a finger in. Using a metal hanger, I could manage to open the drawer even more, or close it a bit, but closing it would make the front panel of the drawer apply pressure to the door, eventually bringing me back to Position 2, where I couldn't fit anything in anymore to close the drawer further. I spoke to the locksmith who said he could make a hole in the door in order to close the drawer. This would mean I'd have to replace the door afterwards, for a price of about 100$. 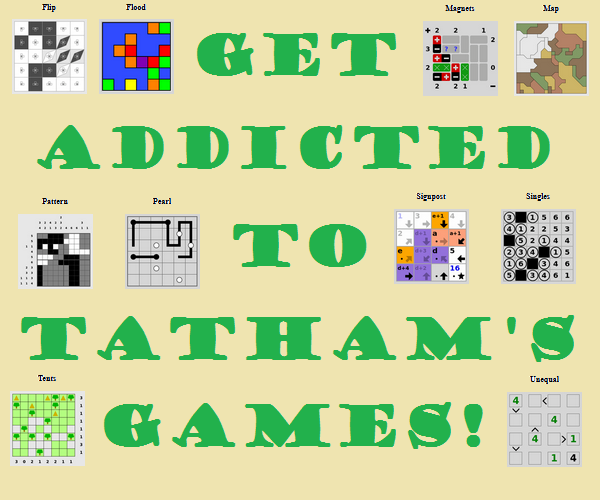 I decided to first test my puzzle solving skills and figure out a significantly cheaper way of closing it. Could you find a way to open the door without breaking anything? Get a sturdy, thin metal bar (say 4mm x 15mm cross section) from the hardware shop. 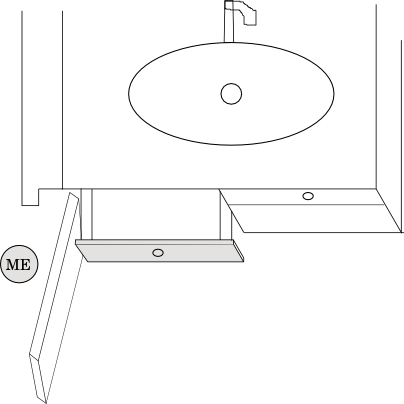 Have the bar bent into an 'L' shape, with one arm about the length from the floor to the drawer (black figure in the diagram). Loop a piece of string (pink figure) around the top of the 'L' to help guide the bar later. 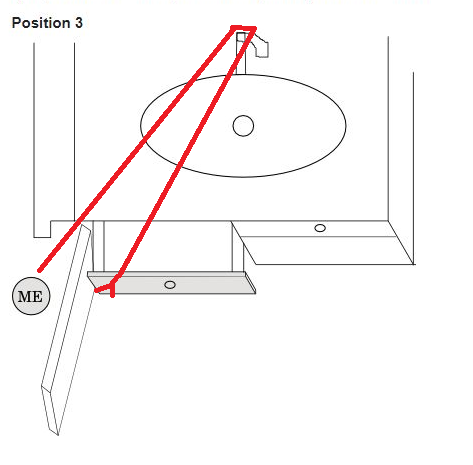 Work the door and drawer so that you can move the bar past the door through the 'L' gap as shown in the diagram, leaving part of the bar sticking out the bottom on your side of the door. Use this part as a handle to manipulate the bar. 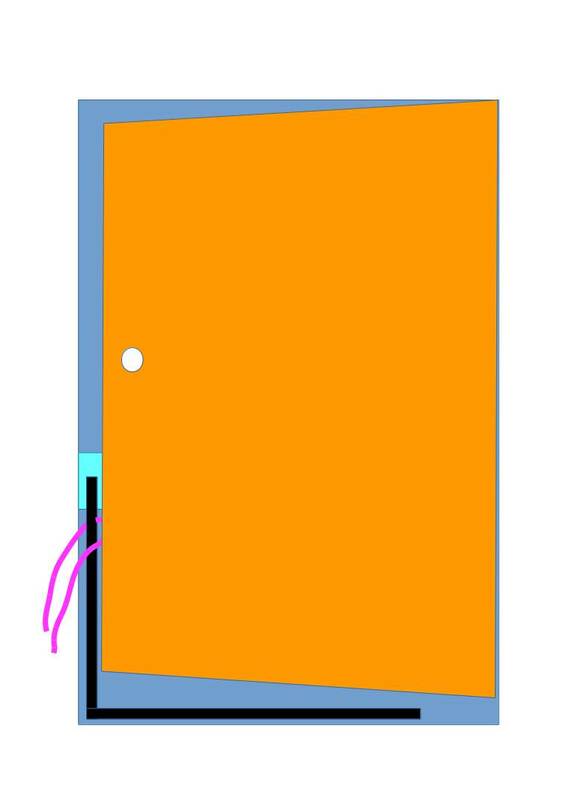 Close the door fully, hanging on to the string at the top and the bar's handle at the bottom. Work the handle while pulling on the string until the drawer is completely closed. 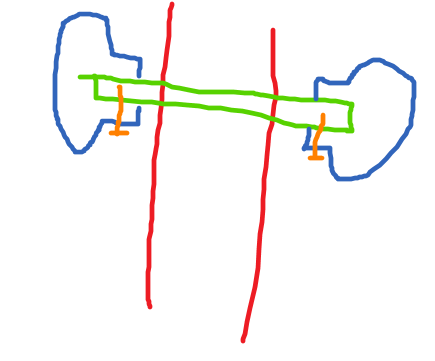 The handle would tend to push the bar to the left and away from you, while the string would tend to pull the bar towards you (and to the left). 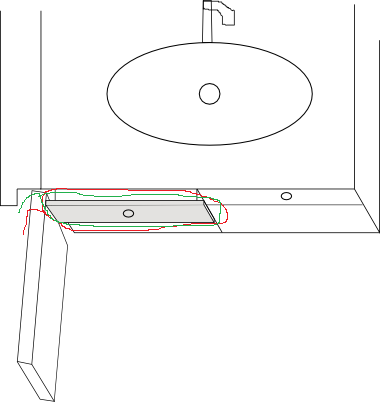 This assumes that there is some lip on the bottom left hand corner of the drawer - if the side of the drawer goes down flush all the way to the bottom of the drawer, this will probably not work, but the diagram implies a lip. Get a length of string and make a slipknot with a generous loop in the end. Using a bent wire coat hanger, manoeuvre the loop over the bottom left hand corner of the drawer. 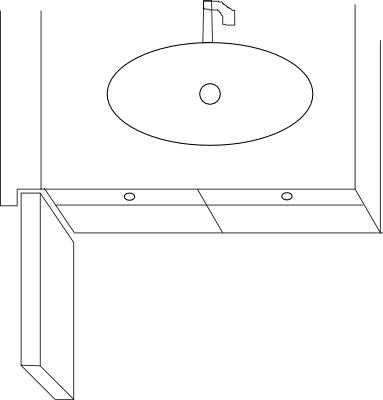 Using a stiff length of thin metal or wood, guide the string around the tap on the sink and let it drop. Pull the string until it is taught and then close the door, continuing to pull on the string. The advantage of this is that, even if the overfilled drawer still wants to open, it will be prevented from doing so before the door can be fully opened. Buy a bag of giant balloons. The bigger the better (you can get some that inflate to at least 75cm across). The tougher the material, the better. Stuff the uninflated balloons into a t-shirt. Keep hold of the balloon openings, but push the shirt through the gap into the bathroom. Position the shirt approximately in the position of the yellow area in the diagram above. Partially inflate the balloons. The openings should still be on your side of the door, while the body of the balloons should be on the other side. As the balloons inflate, they exert pressure on the drawer. Pull gently on the balloon-shirt assemblage until the drawer closes enough to open the bathroom door. Purchase a yardstick and a pipe of < 0.5cm diameter. 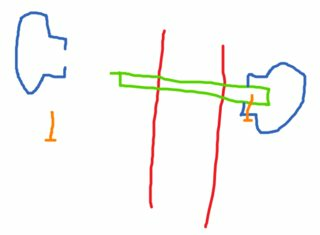 Attach the stick to the pipe, so they are tangential to each other. Slide the stick/pipe combo under the door. Roll the pipe until the stick closes the drawer. NB: The yardstick may have to be longer than a yard. In position 3, reach through the gap and tape a stick (wooden spoon, whatever you have) to the door handle. Get the door back into position 2, and turn the handle. 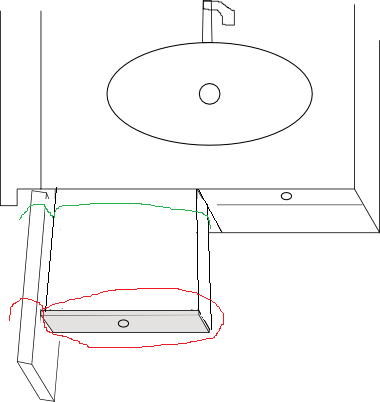 The stick should rotate and push the drawer closed. You can make the door thicker at the height of the drawer to only allow the drawer to open when the door is also open. 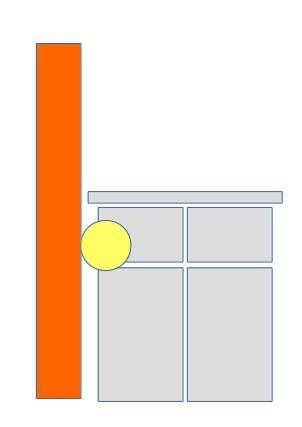 The extra thickness may be a wooden block attached to the side of the door for example. Edit: Optionally you can make the block foldable so you can still open the drawer when the door is closed, but make sure it falls back in place when you are not holding it. Take a piece of string (not too thin - perhaps 3 mm paracord) and tie a small object to the end (just small enough to fit through the gap of the door; you could tie a Monkey's Fist knot if you are using paracord). Pass the object through the gap near the top of the door, then slide the string along the top of the door towards the hinge (past the point where you know the front of the drawer is). Lower the object on the string until it is below the drawer. You can mark the string before lowering it so you get sufficient length. Now push the door against the drawer so the string cannot pass between the drawer and the door (that's why I suggested paracord). Move the string from the top to the side, and start pulling gently. The knot should "catch" the bottom of the drawer. As you feel the knot begin to grab, move the string all the way to the side until it is just above the drawer. All the while maintain pressure on the door so the drawer doesn't move. Now, slowly release pressure on the door while pulling on the string. The drawer will be pulled closed and you can open your door. I deleted my previous answer because I got a better idea. Move to position 3, insert a length of masking or duct tape, and stick its end to any part of the drawer that lies to the right of the door rim (from your outside point of view). Then yank the tape to your right, so it slides on the door rim. This will thrust the drawer to the left. If you give it enough momentum, it will reach near closed position, and you can push the door open to prevent the drawer from opening again. Use rockets (or anything with a fuse that then applies sufficient force). If you decide to use a firework, try to avoid the ones that make big bangs after they launch. Pull the drawer out, using strings to keep it from falling. 3. Get both loops around the drawer, using a hangar if needed. 4. 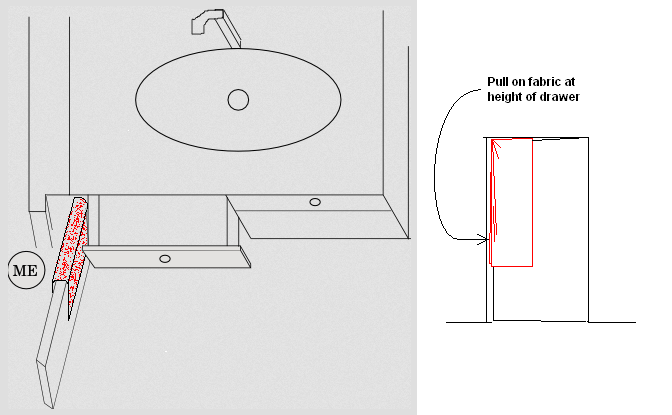 Pull one rope so the drawer opens as far as possible while holding the other rope towards the sink-end. 5. Pull both ropes to lift drawer out and open the door. Drape a large towel or small blanket over the door. You may need to use a stick or piece of wire to help position it. Make sure the towel extends slightly past the latch side of the door. Use terrycloth or some rough fabric; satin or percale will not work. Your major difficulty will be to insure that the towel falls between the door and the drawer. Bumping the door against the drawer will help tell you when all is in place. Now you are going to have to pull the fabric sideways to make this work, so stick your fingers around the door, grab the edge of the fabric, and pull a couple of inches through to your side of the doorway. Keep hold of this from now on. Using the stick or wire, get as close as you can to position 2. Now press the door against the drawer while pulling the towel around the side of the door. The friction of the fabric against the side of the drawer will pull it past the edge of the door. Start by pressing hard against the door, the gradually relax that force while maintaining tension of the fabric. You might do something similar with a loop of rope or chain, but fabric is easier to position properly. With the door open as much as possible and the front panel of the drawer against the door, get some string (as thick as possible, really, those resistance bands for exercise would do nicely) and run it through the gap in the door above the drawer and collect through the gap at the bottom of the door, so it is held in place at the point of contact between the door and drawer. This might require some help from the coat hanger to go over the drawer rather than falling down the side. Then if you hold some pressure against the door (so it doesn't move away from the drawer) and gently pull the top end of the string, it should push the drawer shut, and not slip through the gap between door and drawer. When a drawer opens by itself it could suggest that the content is heavier in the front than in the back of the drawer. So if you have the door open as in position 3 you could drop heavy items (some metal or lead from the hardware store) into the drawer which would land in the back. Then by giving the drawer a push to close it might give enough momementum for the drawer to close completely by itself. Attach a cord to a stick. Push the stick under the door, with the end the cord is attached to against the bottom of the cabinet, below the offending drawer. Using a coathanger, loop the cord around the tap. Keeping the stick braced (possibly just its position under the door should do this) pull on the cord. 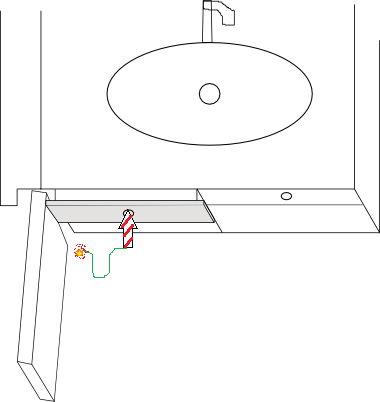 The length of cord between the tap and the floor should tighten, pushing the drawer back in until it is at least flush with the edge of the counter, at which point the door should open. Using a length of string, and probably your coathanger, perhaps you could lasso the drawer handle, and then loop the string around the tap, so that when you pull on the string, it pulls the drawer shut. 'prevention is better than cure' ! 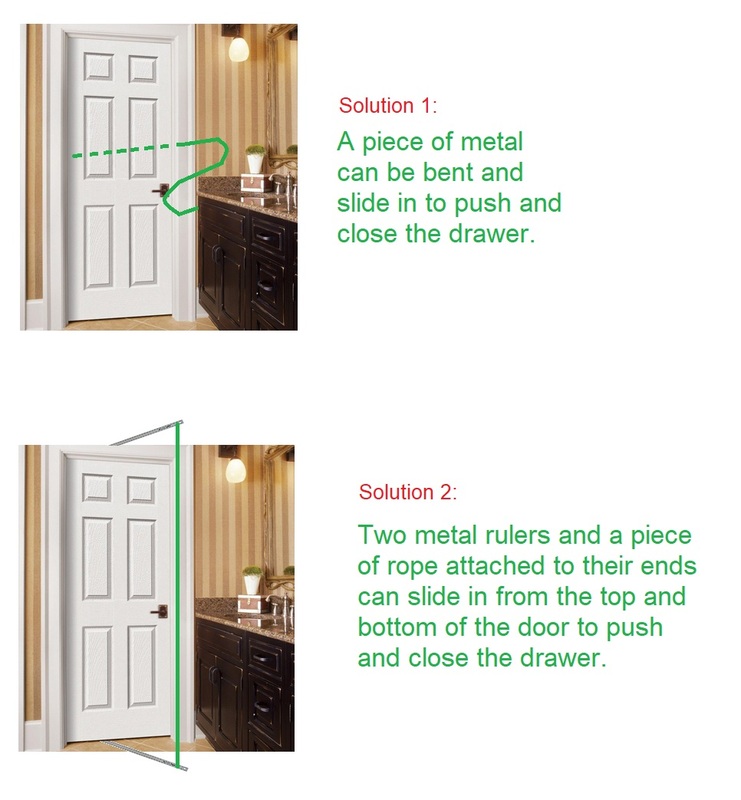 Cut the 'additional' length of the door which causes the obstruction (till the point - where the opened drawer can "protrude out to" )- with the help of a local carpenter and get that wedge of door "fixed" to the non-hinge side of the door and have a new/fresh set of lock-key mechanism fitted. Better, if I can place a diagram - but this is the most of it ! Take a thick piece of rope, about twice the hight of the door in length (and say 1 to 2 cm in diameter) and tie its ends together to form a large loop. Holding the door slightly opened, slip the rope around the door. Now open the door as far as possible, and slide the rope back towards the outside of the door. 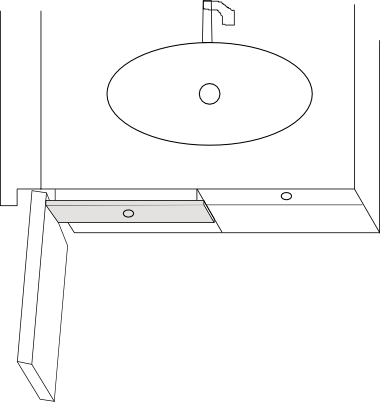 Due to the door being opened and pressing against the drawer, it should be possible to slowly edge the drawer shut. Carefully Pry the door stop off the frame, and you might be able to jerk the door towards you just enough to slip something in to work the drawer closed. Then when finished, carefully nail the stop back into the frame, spackle if needed. Materials: Rubber balloon, flexible plastic hose, nylon string and water. Step 2: Force water through flexible plastic hose into the balloon while holding the intake side until balloon is "heavy enough". Step 3: Secure the balloon intake with nylon end. Step 4: Lower balloon to the floor inside the bathroom - pull at the other end of the nylon. Step 5: Move nylon over to the left so that it fall through the left side of the door (keep holding it). Step 6: Pull nylon so that the water-filled balloon is raised to drawer end. Step 7: See if you can pull it to close the drawer. The caveat of this answer is that there will be some possible damage to the drawer, very minor damage to the door, and possibly damage to whatever objects you are storing inside of the drawer if they were to fall to the floor. The first thing you will want to do is to pull the drawer out as far as you can. Possibly using one or more of the methods in previous answers. Then, take a washcloth, or some other kind of padding available, and wedge it into the gap between the drawer side, and door. Then push hard against the door using your body weight. This should allow you to open the door slightly, maybe just enough to reach your hand in. If you can, empty out the drawer so it will close all the way. Then you could try to close the drawer which would allow you to gain access. If this does not work, you will need to force the door. Remember to keep the padding in between to minimize damage. Open the drawer as far as you can, then push on the door until the drawer itself gives. It is most likely constructed out of particle board, so it should basically give enough for you to gain entry. There may be damage, but that shouldn't matter as long as the drawer front is in tact. After opening the door, completely remove the drawer. Remove the front of the drawer as well, and discard the rest. Also remove the drawer guides from inside of the cabinet for that drawer only. Remove the second drawer to gain better access, and then screw the drawer front on from the inside, as to hide your fasteners. Add a few drops of wood glue for good measure. This basically will turn this drawer front into a "dummy" drawer. Doing this will ensure that the door could never be blocked by it again. Add a wire basket, or a small shelf inside the cabinet to make up for the lost storage space. Assuming you can get a standard cheap metal broom into the space you have several options -- and you might be able to fit such a broom underneath the door or through the crack that the drawer is open. Before doing this, I would recommend threading twine or such through the hole at the top of most such brooms, giving hopefully some means to recover it if it falls out of control. Pushing the soft side against the mirror you can hopefully wedge the end into the drawer: then pulling the broom towards the door with a coat-hanger while banging on it with a hammer could potentially dislodge the drawer, sending it crashing to the ground and opening the door. If that does not work because the drawer is hard to push off of its tracks, the above mechanism "only" opens the drawer as completely as it can go: this is still good. Dislodging the broom and twisting it about, to face the other way (brush side down), you should be able to sweep the contents of the drawer out to the floor: you can then possibly maneuver the broom to a position where it is on the ground and leaning against the drawer, to provide a small force to close the drawer: letting go of everything except for the twine and closing the door, the broom will push the drawer closed and you can now open the door normally. If leaning does not work one can try to pull the twine taut so that the broom hangs freely to get a similar effect, but this may be more difficult as the twine needs to be threaded over the top corner of the door, and it can potentially fall from there. Not the answer you're looking for? Browse other questions tagged visual strategy real or ask your own question.